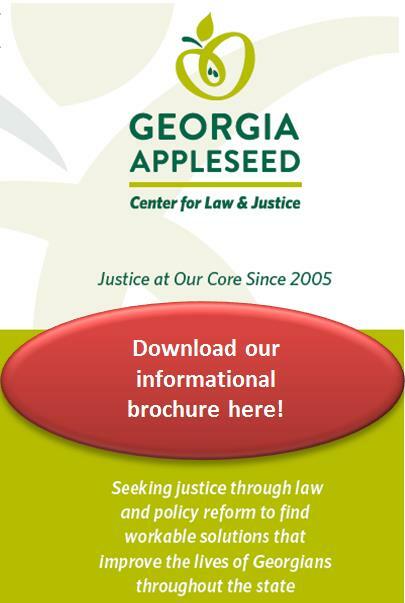 The Georgia Appleseed Center for Law and Justice is a nonprofit, nonpartisan, public interest law center with the mission to increase justice in Georgia through law and policy reform and community engagement. We seek a Georgia where the voices of poor people, children and marginalized people are heard and where injustices that no one should endure are resolved. Despite its small staff, Georgia Appleseed has been able to address serious issues of public concern by enlisting the volunteer services of lawyers and other professionals from around the state. Our projects have inspired hundreds of lawyers and other volunteers to donate thousands of hours of service in objective legal and factual research and analysis; in report preparation; and in policy advocacy. We do not take on individual client representation. Rather we provide meaningful opportunities for lawyers to do pro bono work to advance systemic law and policy changes using a variety of legal skills in ways that will ultimately benefit a large number of people. Volunteers from the worlds of business, education, health care, just to name a few, also value the opportunity Georgia Appleseed projects provide them to use their own specialized skills to help solve difficult social justice problems. Together, all kinds of people, with different perspectives on accomplishing the same justice outcome, come together “around the Georgia Appleseed table” to find solutions that work for all of Georgia. Designated projects and work assignments follow the Georgia Appleseed “Theory of Change” methodology, which divides our projects into three phases. Our Phase I (Investigate) efforts include comprehensive legal research to identify the relevant law in Georgia related to the key project focus areas. We also seek available relevant data and identify data gaps, if any, which should be filled to allow all stakeholders to understand the nature and extent of the identified challenges. We interview a diverse group of stakeholders from around the state to get a broad perspective on the extent of the challenges we face and what solutions might be effective. Once we understand the current situation and identify tentative alternative approaches, we run our findings and recommendations by a project Advisory Committee, composed of experts in the field, who help us to ground our conclusions in workable solutions that are achievable in the short, medium and long term. In Phase II (Disseminate) we will prepare and circulate a detailed written report containing our findings of fact and recommendations for systemic change. Typically, we travel the state to make presentations on the materials to those who are most impacted by the issue. Finally, in Phase III (Advocate), we will develop and implement an advocacy strategy to effect necessary changes to law or policy as recommended through our research. Georgia Appleseed’s projects are not limited to any particular topic, but run the gamut of important issues impacting people who are poor, who are marginalized, and who are our children. Georgia Appleseed is a member of the 18 center Appleseed network. The network was founded nearly 25 years ago by the 35th Reunion Class of the Harvard Law School Class of 1958. Today, the national Appleseed network is thriving primarily because each of its centers is independent, both financially and programmatically, but they all, together, collaborate in ways that help each center to leverage their impact for the benefit of the local community. To learn more about national Appleseed’s founding, please read the article 'What every Harvard law student should know about Appleseed."